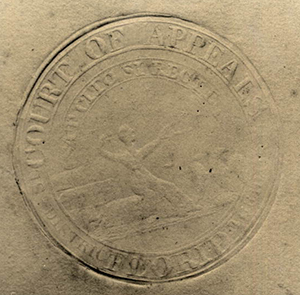 Nevertheless, Mr. Polley learned that the Territorial Court seal was strikingly similar to the present Supreme Court seal, with two notable exceptions. First, a seated Goddess of Justice appears in both seals, but in the Territorial version the eagle faces away from her. Second, the Goddess in the Territorial seal is seated on a bale of cotton, whereas in the present seal she is seated on a block of stone. The use of a cotton bale undoubtedly reflects the importance of cotton to Florida's early economy. 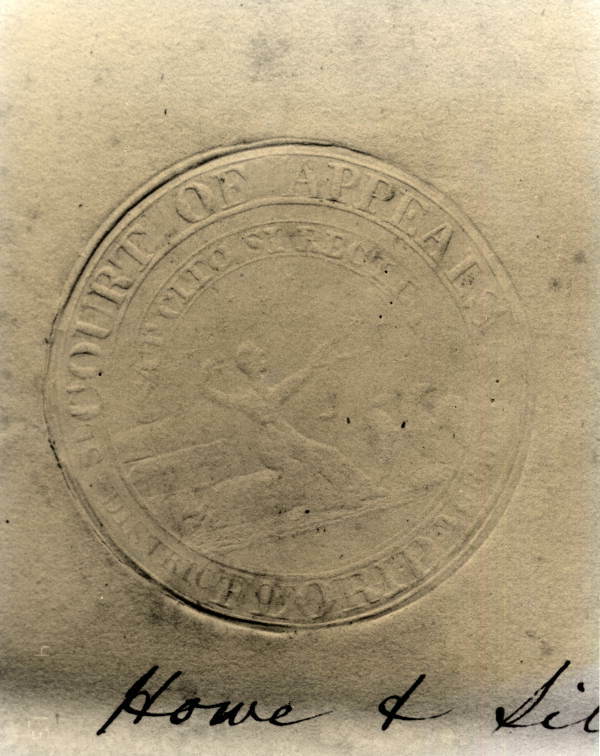 A photograph of the Territorial seal is reproduced here, courtesy of the Florida State Archives. 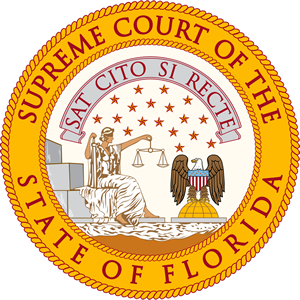 The present seal was officially adopted in 1950, and is the one set into the floor immediately beneath the Court rotunda. As in all prior seals, the official motto is the Latin phrase Sat Cito Si Recte (pronounced as saht see-to see rayk- tay), which means "Soon enough if done rightly." The phrase indicates the importance of taking the time necessary to achieve true justice. To the Greeks, Astraea symbolized innocent justice, which was thought to have prevailed on the earth during the Golden Age. When that age ended, the Greeks believed that Astraea was removed from the earth and placed in the heavens as the constellation Virgo -- the virgin -- an eternal reminder of the innocent justice humankind had lost. Download a High-Resolution copy of the seal.